Well it’s pouring buckets right now outside my window and it made me want to do a post about using rain as a learning experience. As you all know by now I have a young daughter, 16 months, and she has developed a love for mud and puddle jumping. Naturally the first time I took her walking and she decided to plop down in the middle of a puddle with one of her cuter outfits on I was a little hesitant. But the next time I was more prepared. I put her in some sweat pants and a t-shirt and let her run wild. She loves watching the ripples form as she runs and seeing how far the water will splash. For kids grades Pre K-1st you can actually bring the rain inside. There’s an activity where you basically make your own mock rain cloud. You take a glass, or jar, and fill most of the way up (about ¾) with shaving cream. Let it sit for a minute. Then give your child a dropper and small bowl of blue food coloring. Let them drop the food coloring on top of the shaving and watch as the “rain” comes down into the glass. One site with directions on this activity can be found here. Rain painting is a fun activity to do outside. You can use a lot of different materials for this. You can break up pieces of dry water color paints, you can use food coloring, or just plain old magic markers! Have your child color a pattern on a thick piece of paper. Then set it out in the light rain, you can go out there with it, and watch the rain start to transform the image. If it’s a tsunami outside this won’t work, just a heads up. Also, coloring a wet sidewalk with sidewalk chalk is better than a dry one. After the rain has stopped go outside and see how much brighter the colors are. 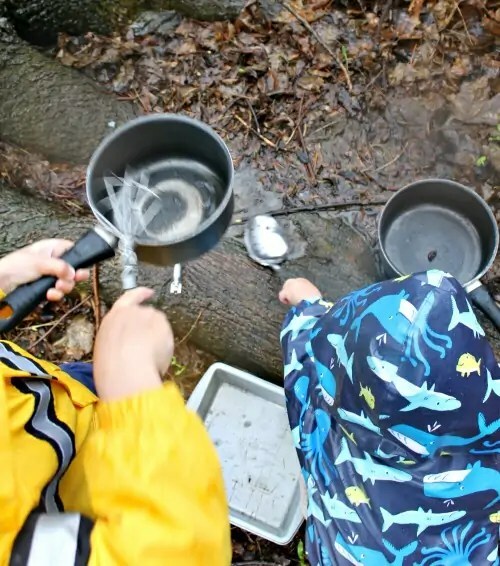 On this blog she wrote about taking her boys outside with some kitchen supplies (pots, pans, large spoons) and letting them use the rainwater for pretend cooking. It is so easy but kind of genius. Puddles alone offer a plethora of fun activities. Make little paper boats and float them around the puddles. The book “The Tin Soldier” has a scene where the soldier is stuck on a paper boat and sent out to sea. Might be a good book to incorporate once you go back in and get dry. You can race things across puddles like ice cubes or curved leaves. It’s a fun creative way to get them doing something during the rainy weather. Bring outside activities in. Have an indoor picnic, make sheet tents. Use the weather to your advantage for ambiance and have a scary movie night. And there’s always water balloon fights. You’re going to be wet anyways. Yeah I think getting kids outside as much as possible now a days is really important.